In the Orange River region the harvest is still seven to ten days behind which has meant that some grape producers couldn’t pack as much for Chinese New Year as they would’ve liked, especially seeing that the celebration comes eleven days earlier than in 2018. These volumes were harvested in week 51, to be inspected and shipped off in week 52. Furthermore, they didn’t have that many grapes of the size demanded by the Chinese market. Over the past few years Chilean cherries have increasingly dominated the Chinese fruit market during this period and this year, with ever more containers of cherries on their way there, will probably not be an exception. 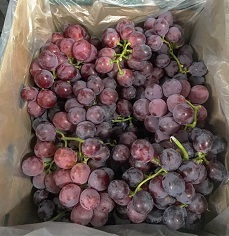 The first cherries have started arriving but, according to the trader, the real effect will be noticeable only when the bulk reaches Chinese shores, and then its impact on grapes (not only those from South Africa, but from Australia, Peru and India too) is swift. Canada has been a welcome surprise. Despite reports of the large amounts of American grapes destined for that market, it seems that traders are preferring fresh stock to stored grapes. There’s a lot of fruit in Europe and the UK, and due to a number of factors the market’s somewhat under pressure. A lot of grapes from Peru and Chile and the many promotions run by stores have had a dampening effect on price points.